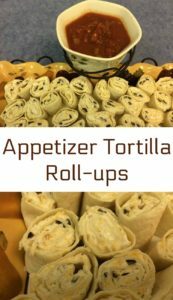 I came across this recipe for Appetizer Tortilla Roll-ups so long ago that I can’t remember where I first found it. In the meantime, I’ve adapted and made some changes to the original recipe. 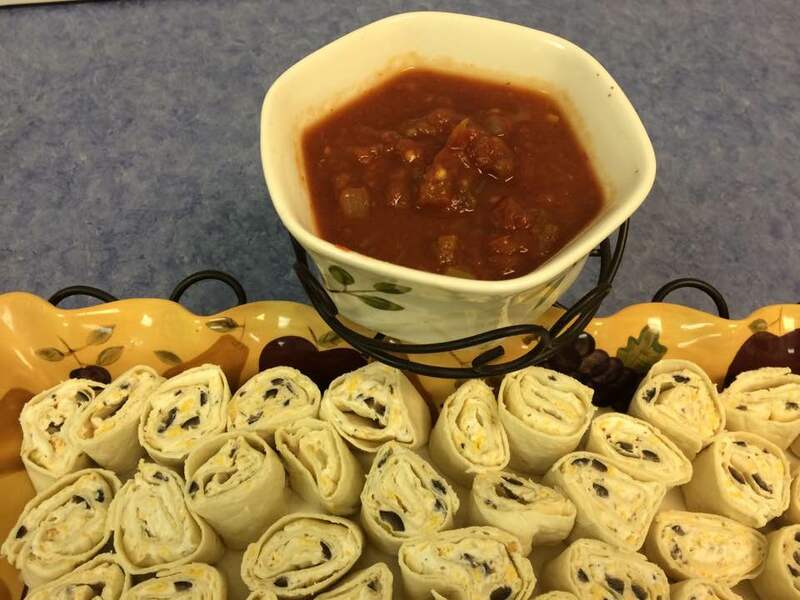 I’ve served these appetizer tortilla roll-ups at home, at sled-riding parties, teas, refreshments after an event, and other special occasions. They make a great appetizer or snack for family or for guests. With this recipe, you can add or nix whatever ingredients you’d like. The filling can be made a few days ahead and then it will be easy to put the roll-ups together in short order. You’ll want to put these together several hours before serving them. (This is why the recipe states that the “cook time” is four hours. You don’t cook them, but they do need to be refrigerated for several hours. 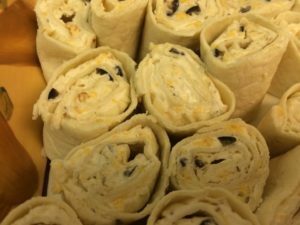 So when you make these, it won’t take long to mix up the filling and roll up the tortillas. 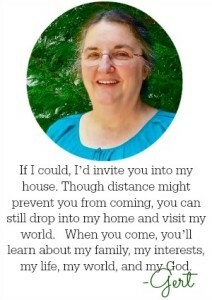 But you need to plan the extra time for refrigeration. Refrigerate and then slice them, removing the ends of the roll-ups. I have added chopped ham or chicken (usually left-over) to this recipe. The red pepper flakes (my addition) add a little bit of zing as well. I’ve used plain Greek yogurt in place of sour cream or mixed it half-and-half. 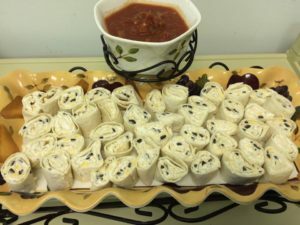 Any way you slice it, these appetizer tortilla roll-ups are a fun addition and flair to any party or event! Serve them on a round platter with a bowl in the center for the salsa. Or you can serve them on a rectangular tray and serve salsa on the side. If you have leftovers, refrigerate them in an air-tight container. They will keep for days. The tortillas do not become soggy, and your family will not realize they’re getting left-overs! A quick and easy yet festive snack or appetizer that gives a different flair to "refreshments." Mix all but the last three items together thoroughly.